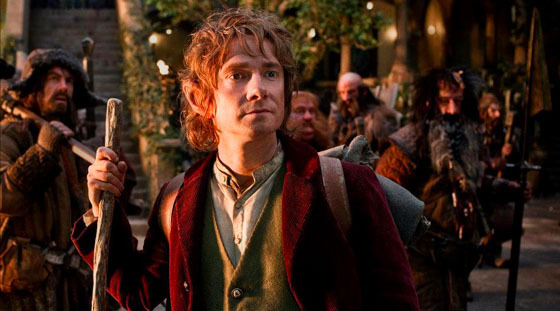 Martin Freeman in The Hobbit. Photo courtesy of TheHobbitBlog.com. If you've been keeping up with the latest news about Peter Jackson's film of The Hobbit, you might have heard that the audience who saw a ten-minute preview of the film at CinemaCon (or at least a part of that audience) did not like the look that a 48 frames-per-second projection rate gave the movie, comparing it unfavorably to the "cinematic" quality produced by the usual 24 frames-per-second. Devin Faraci of Badass Digest wrote that the movie was "drenched in a TV-like - specifically '70s-era BBC - video look," adding, "It looked completely non-cinematic." Entertainment Weekly's Anthony Breznican said, "The clips Jackson went on to show looked more like visiting the set of a film than seeing the textured cinematography of a finished movie," and Charlie Brooker took the opportunity to opine, in the Guardian, that movies and TV news are just looking too similar these days. Apparently, Brooker misses the time when TV stations "had the decency to commit to appalling production values." These criticisms are all based around the idea that The Hobbit looks too much like either TV or video. Apart from Brooker, the many, many people complaining about the footage (this was just a sample) are missing a crucial point: TV doesn't look like TV anymore. Shows as diverse as Game of Thrones, The Walking Dead, Lost and Arrested Development don't suffer from the supposed "fluorescent" look associated with soap operas. Hell, even some multi-camera sitcoms - historically some of the worst offenders when it comes to the "1970s BBC TV" look - have broken out of the rut. Just compare the naturalistic lighting and muted colors of How I Met Your Mother to an episode of 2 Broke Girls, and you'll get the idea. The quick dismissal of the format looking "like TV" should ring false to anyone who watches television on a regular basis. What these dismissals really are is a reflection of the assumption that cinema needs to look different from TV: that it has to look "cinematic" in order to be respectable and, more importantly, that television has to look non-cinematic. Faraci in particular lumps all TV in with those BBC miniseries in order to get his point across, and in the process demonstrates his own conviction that the look of cinema trumps the look of television every time. I don't know if The Hobbit actually looks as bad as Faraci and Breznican claim. I won't know until I see it. What I do know, however, is that the dichotomy set up between film and television is demonstrated as false by the breathtaking shots of Pyke and the Hand of the First Men in Game of Thrones and the sight of smoking wreckage marring the sparkling water and white sand on Lost's beach. If you want to criticize the look of The Hobbit, that's fine. But don't ignore the brilliant camerawork being done every week by television directors in order to do it.